Don't leave the important things to chance! Measure out your morning espresso with Update International's Measured Shot Glass. This easy to read shot glass includes three clearly marked graduated lines that measure in ounce or liter. 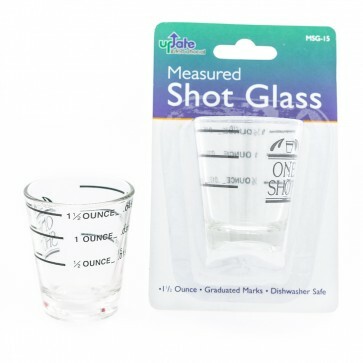 Sturdy to the touch and dishwasher safe, this shot glass can handle all of your beverage measuring needs! Graduated Marks - The easy to read graduated lines makes measuring liquid a cinch! Dishwasher Safe - Simply place the shot glass in the top rack of your dishwasher when ready to clean. Units of Measure - The graduated marks allow you to measure in ounces or liters. Wipe with a warm wet cloth or place in your dishwasher after each use.